GOOD NEWS ALERT. Thanks to the transfer of some fossil material from UCL Geology Collections to the Grant Museum of Zoology, the Museum is now definitively the unique home of underwhelming fossil fish on the UCL campusTM. This transfer will keep the series going for a further 40 years on top of the next 70 years of underwhelming fossil fish of the month until the series is forced to examine an fossil fish that may be of interest. For those of you unfamiliar with the monthly format, it works in exactly the same way as reality TV talent contest shows like the X Factor does. Except instead of people, there are only fossil fish and instead of searching for outstanding entertainment talent to slowly homogenise week on week into formulaic flash-in-the-pan popular music success we’re searching for indistinguishing blandness. Also, there aren’t judges or voting or live shows or broken dreams or insufferable presenters or music or six chair challenges or sad stories about dead grannies or guest appearances by pop stars who have an album or a tour to promote. Other than that, it is exactly the same. This month to commemorate the influx of new old material into the museum, our talent scouts have picked out one of the new kids. Let me underwhelm you with it. Voting is now closed. Here’s this month’s bright eyed hopeful with a unique grime/a cappella style we’ll turn into a haircutted ballad murderer by week nine ((enough of the X factor stuff now- ed) Who is ed?- Mark). According to the ever reliable and unquestionably accurate documentation with this specimen, this is ‘Naturalien Handlung Palaeniscus Freiis lebeni Ag Copperslt..(?) Ruche (?)’. Which requires a wee bit of unpacking. According the the resident German translator associated with the Grant Museum of Zoology, Naturalien Handlung could indicate that this specimen was purchased from a shop and Palaeniscus Freiss lebeni is likely a mistranscription of Palaeoniscus freieslebeni which itself is sometimes a synonym of Palaeoniscum freieslebeni although both versions of the name can be found in the literature. Palaeoniscum is an extinct genus of ray-finned fish from the Late Permian of Europe and North America, around 250 million years ago and notable for being pretty much fish-shaped and fish-sized. This specimen appears to be missing much of or all of the head. Here’s what this fish may have looked like in life thanks to a palaeo-artistic reconstruction by an up-and-coming-everybody-is-talking-about-them-deceptively-younger-looking-then-they-are-palaeo-artist* who is also available for commissions especially Twitter avatars and greetings cards for people you don’t really like that much. Artistic reconstruction of LDUCZ-V1810 Palaeoniscum freieslebeni by up-and-coming-everybody-is-talking-about-them-deceptively-younger-looking-than-they-are-palaeo-artist. Note the attention to making sure the white bit of the spine appears in the correct location and the detailed scale illustration. Preservation Given that the label information isn’t helpful in working out where and when this specimen came from, looking at the preservation and comparing it to other examples of Palaeonsicum it is possible that this is from the Zeichstein, a lithostratigraphic unit from the late Permian that extends across northern and central Germany and Poland which was mined for ‘copper slate’ and where a lot of these fossils originate from (and perhaps what Copperslt relates to in the label information). Palaeoniscum freieslebeni fossils are so common from these localities that it is known in German as the ‘Kupferschieferhering’- the copper shale herring. Although the tail of this specimen is well defined quite a few key features seem to not have been preserved. The skin although detailed enough in some regions to show details of the scales is partially preserved and not much, if anything can be made of the fins and obviously the anterior protion of the fish is jumbled up and missing. In the top image you can just about discern a gold band highlighting some of the scales which is likely the mineral pyrite (more commonly known as fool’s gold) especially common in the marine clay of the copper shales. 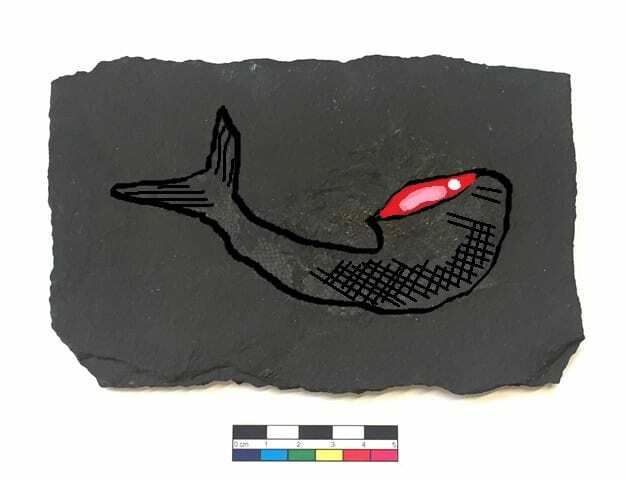 The Kupferschiefer is known for its exquisite preservation of these fossil fish so we must feel very privileged to be looking at an example of a not particularly well preserved or complete one. LUCKY US. Scientific Research Palaeoniscum is a influential genus in that it lends its name to a whole order of extinct fish, the Palaeonisciformes which derived from Greek means ‘ancient woodlouse’, probably in reference to this group’s habit of crawling behind the fridge and dying organisation of scales which allegedly look like the carapace of woodlice(?). Palaeonisciformes isn’t thought to be a natural grouping of these fishes (this is called paraphyletic) but a grouping of similiar looking species that nobody really cares about enough to look at the proper systematics requires more research to organise. Which is exactly the kind of commentary that makes Palaeoniscum an undoubted underwhelming fossil fish. Despite a long history, well known localities with hundreds of excellently preserved individuals and a group that is well represented in museum collections, studied by some of the greatest palaeoichthyologists ever known, the dial on the excitometer has barely touched “meh”. Meanwhile, if you listen very carefully and the wind is blowing in the right direction you can hear palaeontologists working on the 52nd Tyrannosaurus rex bite force calculation paper this week. In Society Obviously, there’s very little societal impact from Palaeoniscum so instead I’d thought I’d share some wonderful examples of trying to pick my way through the German literature relating to Palaeoniscum via Google Translate which struggles at the best of times but really makes things interesting when it comes to the technical literature. 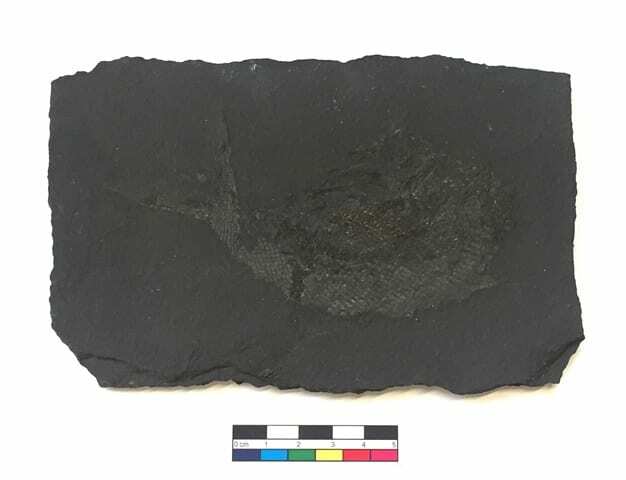 The copper shales where Palaeoniscum is found has led to exceptional preservation of gut contents of fish including “flap remnants of the arm feather” of brachiopods as well as “ten-footed cancers”. In addition to fishes terrestrial animals are also found including the gliding reptile Coelurosauravus according to the Google translated German, Coelurosauravus is “oldest well-known vertebrate, which could move by tree-to-tree glide, as is the case with today’s giant guards, airport or flight kites”. Diedrich, C., G. 2009. A coelacanthid-rich site at Hasbergen (NW Germany): taphonomy and palaeoenvironment of a first systematic excavation in the Kupferschiefer (Upper Permian, Lopingian). Palaeobiodiversity and Palaeoenvironments. 89: 1. pp7-94. Helen is very happy indeed in a rather canny, Scottish way – I can’t tell you how delighted I was when I saw your magnificent artistic reconstruction. I even cracked a smile. I was especially taken by the delightful foray into colour, adding a nicely gory element tempered by the scientific observation of the location of the spine. Sublime. Not only have you surpassed yourself with your exquisite artistic reconstruction, but also with your linguistic skills a la Google (I mean – ‘flap remnants of the arm feather’ – sheer perfection), which cast a distinctly subversive yet enlightening aspect on the description of the specimen. To be honest, this month’s foray into the mind-numbingly underwhelming world of piscatorial preservation is the highlight of the series thus far. I’m so overwhelmed I now have to go and find a nice dark corner of the collections stores in which to regain my composure. If you continue this level of quality, I don’t know if my blood pressure can take it. Genuinely excited to catch this fossil fish before the turn of the month! Normally it comes after not winning the premium bonds and turning the page on the milkmen’s calendar!